FF&EZ® Design Specifications Software :: Technology Outlook: Partly "Cloudy"
Home > Blog > Technology Outlook: Partly "Cloudy"
We all hear the buzz about the move from traditional "local" applications software (in which you install and maintain software on PCs located physically in your office) vs. "cloud-based" applications that use standard web browsers to access the software and data that is stored on servers located elsewhere. The success of this approach depends on the nature of the work you are trying to do; we discuss this in more detail to help you understand the issues. There is a television commercial currently playing in which the destruction of a kitchen by two battling robots is interrupted by a fellow wielding a remote control. He walks into another room, continues the fight by clicking his "Play" button, then repeats this as he walks into yet another room. The pitch, from a TV content provider, extols their technology's ability to let you to move from one TV to another to watch a show. My reaction to this every time I see it is "That's really cool!!! And I need this for, uh...what?" Repeat from Step 1 if more blending is required. Press the "Pulse Blend" button. Let go when the contents look right. We have to be careful about why and when we adopt new technologies. At the same time, this is hardly a black-and-white issue. The key is to take a hard look at the pros and cons and decide, for each task, what kind of technology is appropriate. 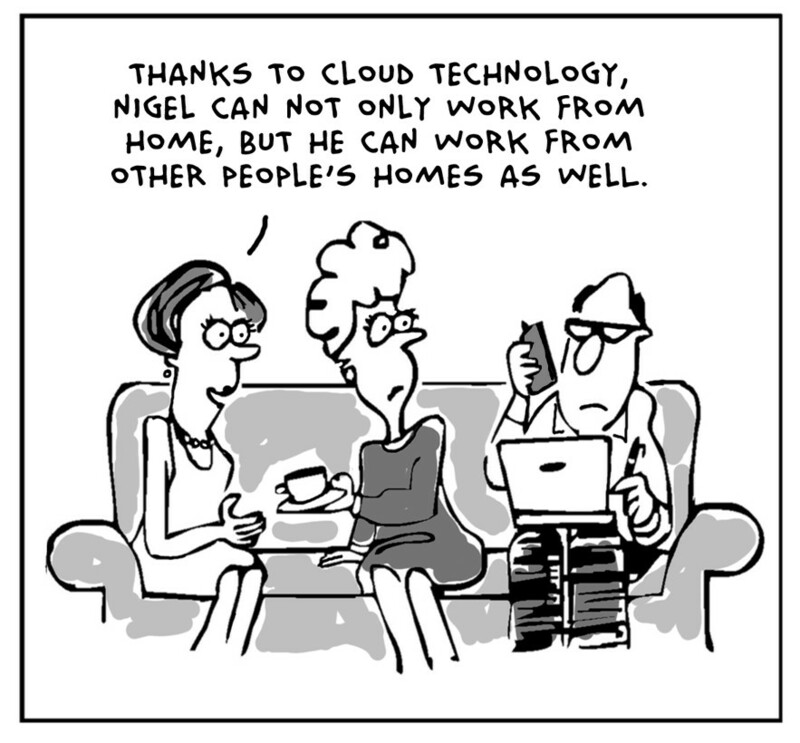 This is currently an issue for business people looking at "cloud" computing. Cloud computing is the generic name for Someone Else providing your software and storing your data at another location Somewhere-On-Earth (is that near Walton-on-Thames?) and which you access as-needed via any web browser. It is rapidly gaining ground as an alternative to traditional software that you purchase and install on your local computer or server. There are tremendous advantages to this approach, but also some clear downsides and you will want to consider both in relation to your business needs, not the theoretical but very cool "features" that accompany the pitches for cloud-based computing (and digital video services). For individuals and smaller organizations, the single biggest advantage is the ability to work from any web browser on any PC that has an Internet connection. Obviously, this breaks the tie to The Office in a big way, allowing you to get actual work done in situations that would have been wasted time or where a timely response is critical. Okay, that really depends upon whether you are going to be a strictly Google Docs shop or actually pay a monthly "rental" fee for more high-powered or vertical market software. However, the cloud model makes it possible to scale your software costs up or down depending on what your employees' software needs are — and if you have only basic software needs, your production software costs may actually tip the scale at zero. Although document sharing has been possible for many years now, cloud apps are more focused on that aspect of group computing — and greatly open the possibilities of sharing documents and data among organizations involved in a collaborative project. Even if you are technically inclined, the effort to keep software up to date may not be a productive use of your time. In larger companies, a smaller tech staff may be possible and for individuals, not having to upgrade software yourself may be a real blessing. Of course, this isn't entirely true — since you need something with a web browser — and never make the mistake of thinking that a tablet used with your finger is a serious input device. However, network hardware and the support personnel needed to maintain it become a smaller concern, especially in small offices, leaving your IT budget able to support more creative uses of IT skills (or just smaller). I publish this blog using cloud-based content management software. But I'll let you in on a secret: I don't write the first draft that way. Why? It's slower than my word-processor, which is slower and more complicated than WordPad. The same difference holds for any software task with a high volume of data input, such as product descriptions or databases with many fields that need to be verified against rules before updating the database. You've already experienced this in a less-obvious way if you've ever set up an online shopping account or searched for the best travel arrangements. Maybe it did not take too long and it was only mildly frustrating when the remote data server put "Data entry errors were found!" at the top where you couldn't see it. However, it is important to ask yourself "What if I did this type of input for hours at a time?" Perhaps you've not really noticed this yet. The next time you deal with entering data at a website, stop and notice the short (or often long) lag after you click on "Next" or "Update," then imagine this over many hours of work compared to the nearly zero lag you see with locally-installed software. If you do a lot of editing or data entry work, moving to a slow editor could be a frustrating mistake — and software that operates entirely within your PC will always be substantially faster than one that does so across thousands of miles of communications network. A related issue is that web interfaces are more mouse-dependent and provide much less ability to use "shortcut" keys that save experienced users enormous amounts of time in doing their work (typically the shortcut keys are already dedicated to the browser itself, not the cloud application you are using). Shortcut keys may not matter to casual website users, but for mission critical tasks, they can literally give you a couple of days of vacation. Are you writing recipes or just serving dinner? The above issue of slow data input leads to a simple question about each task you want to do with cloud software: How much of it involves creating content vs. searching for, reading or presenting content? Cloud-systems may be ideal for giving your staff and clients quick and easy access to data, drawings or presentations, but this doesn't mean that creating that content is efficient if "on-line" is the only way you can do it. Wait, this doesn't include a flux capacitor! One big difference between general purpose cloud software and its traditional equivalent is that cloud-based software often has fewer advanced features. Now, that is a very relative assessment. This may not be an issue at all for most people, because they may not need the advanced features found in modern word-processors and spreadsheet applications. But if you have a power-user in your group (or a potential one), be prepared to either let them continue with their current software or lose an enormous amount of the firepower they provide. It also goes without saying that you should check the features you need against what a cloud-based program offers — you may be using an advanced feature and not know it! Did someone install an upgrade while I wasn't looking? Now we are getting to some of the hidden surprises lurking in the mist. If you have local software on your own computer, you have both the hassle of keeping it updated and the control over when to do it. Control over the timing of a software update may not be possible with cloud-based applications, especially those with large user populations. Can you imagine what it would be like to arrive one morning with a crucial afternoon project deadline and discover that your IT person upgraded your mission-critical software to its "new and improved" user interface? Do not ask for whom the horn honks, that's just the last express mail pickup leaving without your proposal. That new feature? It's actually a bug. An issue related to losing control over when software is updated is that of losing control over productivity because an installed update suddenly "breaks" a feature on which you depend (to finish by that deadline I mentioned). Most software users are not aware of the background noise on professional technical sites: warnings about whether or not to immediately install a particular update. Unfortunately, it's an ongoing spectacle for those watching behind the scenes, and your lack of control over updates to "their" cloud software can mean no ability to "uninstall" a bad update. Your area is experiencing a "Temporary Service Interruption"
Here is a problem that the cloud-salespeople may not highlight: If your business depends on cloud-based software, an interruption in service from your local internet access provider can leave your office just as dead as a total power failure (and remember, if you have locally installed software and a good backup power plan, you may not go down at all during a power failure). Our company is experiencing a "Permanent Business Interruption"
And here is the Big One, and that pretty much says it all right there, doesn't it? No, there is little likelihood of Google Docs or Microsoft's Office Web Apps disappearing tomorrow, but the farther you venture into the territory of cloud-based vertical market software (accounting or other database applications especially), the more your business is exposed to a total functional disaster. This could come with the disappearance of the software company itself or (less permanently) that of the company that provides its server farm. One major problem with cloud-based services that is often sold as a "feature" is the fact that your software and data can be located anywhere on the planet in a facility run by just about any well-trained team that understands how to set up a vast field of servers. Yeah. Anywhere by anybody. Think about it. Who loves you, baby? Are you a sugar daddy or just an orphaned child? Finally, moving to a cloud-based approach can share the same unintended consequence that people have now learned about outsourcing. Experience shows us that successful organizations are those in which all the component departments and individual employees work towards shared goals — the organization's goals, not those of individual managers and executives — and that creating relationships that are something other than mutually supportive ones can undermine those organizational goals. As in outsourcing, by moving to cloud-based systems you may be giving control and support of mission-critical functions to someone whose goals are not the same as yours, and "making the most money at the least cost" is a very different goal when it is you who may be supplying the money. This difference is just a start, because the responsiveness of a vendor may be directly related to how big you are — relative to their most profitable customers. If a change in your cloud software's features or the vendor's policies or ownership suddenly affects you adversely, how much clout will you personally have with them? Clearly, if you jump into this cloud-like bed of roses too hard or without thinking, its thorns may leave you bleeding. What to do? The way to work through this is look at the work you do and come up with a combination of local hardware/software and cloud applications that gives you the best mix of freedom, functionality and safety. There is no rule that says you have to be one kind of "shop." It offers the same kind of "anywhere there's an internet connection" access to your stuff but minimizes disadvantages you might see in true cloud-based software approaches. Since it uses computers already set up at your office, data sharing works exactly as if all players were working there. The software response (speed) is nearly equal to what you see on the office PC itself since only keystrokes, mouse coordinates and screen images are normally being sent between the two points (that is, the browser is mostly doing what it does best, being a display device). Remote-access solutions may depend on your own servers or on those of a remote-access service provider. In the case of the latter, remote access service is such a fundamental product that your service provider could disappear from the face of the earth tomorrow and you could still switch to another provider offering remote access within a few minutes. The only disadvantage is that they require you to install a small "client" software package on the computer with which you want to access your office. Many of these remote access solutions can print documents to a local printer (a printer located where you are currently working) in addition to the printers in the office. Also, most can transfer files between the two computers, including PDF files that you might create if local printing wasn't available with that product. Depending on your needs, tighter data security can be provided by a built-in VPN (virtual private network). Finally, the better known packages allow a Macintosh or iPad to remotely access a PC without the possible slow-down associated with a PC simulator running on a Mac. Some suggested products of this type can be found here and here. They range in cost from free to a small monthly fee, while more comprehensive approaches like ThinStuff XP/VS, Microsoft Server 2012 Remote Desktop Services or Citrix are available for small to larger organizations. Now that you have a better understanding of the issues involved in "local" computing vs. "cloud" computing approaches, you can analyze your specific software needs in terms of several factors. Here is one way to start: Below is a table containing typical software functional concerns and the different ways that these approaches satisfy them (noting that your assessments of their importance may differ). 1This row's entries depend on how much "function" you require. For basic office tasks, cloud-based software might be "excellent" whereas it might be barely "acceptable" for high-volume data entry. On the other hand, the remote desktop approach gives very good access to all software on your PC, regardless of what type it is (including CAD). 2Local software can still be of the type that shares content by "publishing" to the web, however. on this particular issue I am only considering sharing by one's team members. 3Obviously, future updates are affected if a software company goes under, but the current software will still function "as is." 4The hardware needs of individuals and small offices may not be much different with cloud software, since you typically need a basic workstation and printer to accomplish tasks. Your answers to the questions raised here should point you towards an approach that takes advantage of newer technology without causing an unexpected hit on your productivity by using a technology that is inappropriate to a task. My bet is that you will find that the traditional software approach for middling to heavy content creation is still a solid choice, even as some of your activities naturally move to the Internet. You simply don't want to lock yourself in to the wrong tool in any specific area. So, the proper approach is actually encapsulated by a really old proverb, isn't it: Keep your head in the clouds but your feet on the ground. In sturdy, no-nonsense shoes.